The 2016 Call of Duty World League Championship will wrap itself up in a big way. It’ll be the focal point of Call of Duty XP, Activision’s gigantic event centered around their biggest franchise. There will be more than just the championship: expect laser tag, paintball, developer panels, exhibits, displays, photo opportunities and an immersive ride powered by Playstation VR. 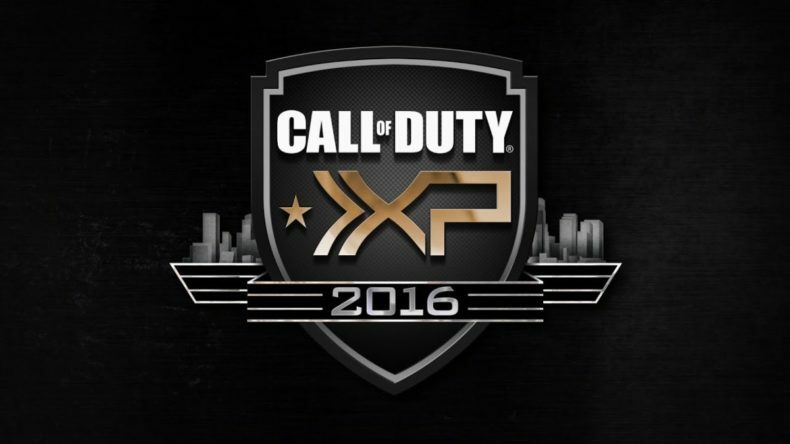 Tickets for Call of Duty XP will go on sale June 11. This is right before E3, so if you’d like to go, don’t let the date slip your mind. Santa Monica, CA – June 8, 2016 – Call of Duty fans, prepare for the biggest gathering of the global Call of Duty® community, as Activision Publishing, Inc., a wholly owned subsidiary of Activision Blizzard, Inc. (Nasdaq: ATVI), presents Call of Duty XP, the ultimate interactive experience and fan celebration, taking place at the Forum in Inglewood, California, September 2 – 4. Call of Duty XP 2016 will bring the thrilling finals to the Call of Duty World League Championship, Presented by PlayStation®4 and played on Call of Duty: Black Ops III, as well as the reveal and first hands-on for Call of Duty®: Infinite Warfare multiplayer, Call of Duty: Modern Warfare Remastered multiplayer and new Call of Duty: Black Ops III Downloadable Content. Fans will also get to play the first Call of Duty VR experience on site, and will have other ‘you-had-to-be-there’ live action experiences inspired by Call of Duty, including Nuketown paintball, Zombies laser tag and other fun. The epic Call of Duty XP festivities center around the eagerly-awaited Call of Duty World League Championship, Presented by PlayStation®4, the culmination of the inaugural season of the Call of Duty® World League (CWL), Presented by PlayStation®4. After nearly a year of tough competition from across the globe, 32 of the top teams worldwide will compete for more than $2 million in prizing, as part of the CWL’s 2016 prize pool which tops $3.5 million. Both prizes are the largest in Call of Duty history. After setting viewership records for Call of Duty competitive events during the Stage 1 Finals, the CWL is moving toward the highly-anticipated Stage 2 Finals, where the first Call of Duty World League Championship qualifiers will be determined. Major League Gaming is the official tournament operator of the Call of Duty World League Championship, Presented by PlayStation®4. Fans can watch the excitement unfold live in game (Black Ops III PS4) via the Live Event Viewer, MLG.tv on the web and mobile devices, and at www.callofduty.com. Additionally, live at Call of Duty XP, thousands of eager fans will witness the world-premiere of Call of Duty: Infinite Warfare multiplayer, and be the first in the world to go hands-on with multiplayer as well as Infinity Ward’s all-new cooperative zombies mode. Attendees will also be the first to play Call of Duty: Modern Warfare Remastered multiplayer. Fans have the rare opportunity to play the latest Call of Duty games before their highly-anticipated November 4th release. Additionally, further reflecting the full breadth of the Call of Duty franchise, attendees will be among the first to play new downloadable content for Call of Duty: Black Ops III. All Call of Duty XP attendees will have the chance to compete for prizes by showcasing their skills in 6 vs. 6 competitive matches, as more than 500 gameplay stations will be set up on site for fans to enjoy. Built specifically for the community, Call of Duty XP immerses fans in all of the action and excitement that embody Call of Duty. Players will be able to challenge each other in a frenetic paintball battle on a life-sized Call of Duty: Black Ops Nuketown multiplayer map, or team up with other fans in an intense laser tag experience inspired by Infinite Warfare’s new zombies game mode. *Ticket prices will include additional service fees. Additionally, all ticket levels will include bonus digital content for both Call of Duty: Black Ops III and Call of Duty: Infinite Warfare, which include a calling card and weapon camo for each game. For fans who can’t attend Call of Duty XP in person, select events from the celebration, as well as the Call of Duty World League Championship, Presented by PlayStation®4, will be livestreamed in HD on Twitch at www.twitch.tv/callofduty and on YouTube at www.youtube.com/callofduty. Call of Duty XP precedes the year’s most anticipated entertainment launch on November 4th when Call of Duty: Infinite Warfare launches worldwide, along with Call of Duty: Modern Warfare Remastered*, both of which to release on PlayStation® 4, Xbox One and PC. The titles are not yet rated. *Call of Duty: Modern Warfare Remastered contains only 10 MP maps from the original Call of Duty: Modern Warfare game. Modern Warfare Remastered is a full game download. Internet connection required. For more information, please visit www.callofduty.com/MWR_FAQ. Call of Duty: Modern Warfare Remastered is included with the Legacy Editions and Digital Deluxe Editions of Call of Duty: Infinite Warfare. Check local retailers for availability of all Call of Duty: Infinite Warfare Editions. For more information about Call of Duty XP 2016, ticket information and the Call of Duty World League, Presented by PlayStation®4, please visit www.callofduty.com/xp. Fans can also follow @CallofDuty and @InfinityWard on Twitter, Instagram and Facebook.